This ring is set with two free-form stones of gorgeous blue natural Kingman turquoise set horizontally and decorated by Sterling leaves wrapped around the stones. It's a nice design in an over-sized ring set with superior natural turquoise. Do pay attention to the dimensions and sketch out this ring using the dimensions cited to get a true idea of its size. 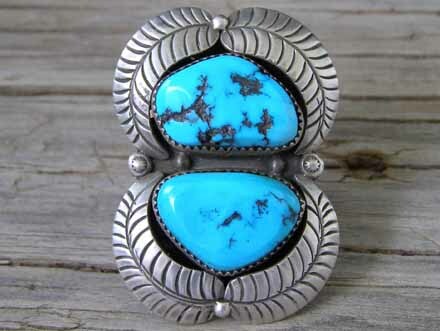 Beautifully executed smithing with superior natural turquoise. Hallmarked "M" on the ring back. Stones: top 7/8" x 9/16"; bottom 7/8" x 5/8"
Size of ring face: 2" x 1 3/8"